The semi-finals started with a lot of “feeling each other out” on both sides and trying to get an idea, on how the compositions and synergies work. It wasn’t until 5:55 minutes, when ‘Adjust’ got First Blood on ‘Xaliea’, which was answered with a Triple Kill by ‘QVOfred”s Thanatos (dubbed #QVOFed on Twitter by fans) at the 7:40 minutes mark. 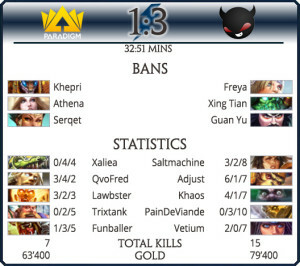 Despite (or maybe because) of their strong counter, ‘PARADIGM’ over-extends 16 minutes in and ‘Enemy’ gets not only 3 exterminations, but also a Gold Fury and a Mid Tower, which turns into a clean-up by the 19th minute, when all of our boys’ other Tier 1 objectives are destroyed as well. 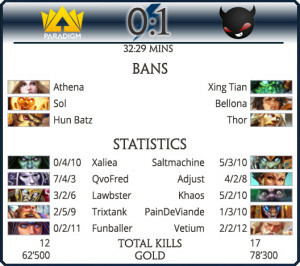 At 22 minutes on the clock, ‘Saltmachine’ strikes with a Double Kill and his team proceeds to take a Gold Fury, but ‘PDG’ responds with a Deicide, evening the score to 10:10 and starting the Fire Giant. Because ‘NME”s members spawned and approached though, the Giant had to be dropped and was unfortunately continued and finally picked up by ‘PainDeViande”s team, costing ‘PARADIGM’ the Right Phoenix. When ‘Enemy’ exterminate the Middle Phoenix at 28 minutes, the Serqet poison spreads amongst our boys during the defense and ends in a disadvantage of a 15:11 score, setting up another Fire Giant for ‘NME’ and – ultimately – the game. Starting out as a ‘PARADIGM’-dominant match at first, turns into an even score of 3:3 around the 10 minute mark. Our boys not being specifically happy about the turn-out, trade 1 for 2 deaths and a Gold Fury, by blinding ‘PainDeViande”s Khepri with an Xbalanque ult, catching up the score to 4:5. The joy didn’t last too long though, since ‘Enemy’ evened it back out to 5:5 and a Fury of their own at the 23 minutes mark. Over the next bunch of minutes, kills are traded left and right at a pretty quick pace, ending in a Fire Giant around 29 minutes and with a 11:7 for ‘NME’, allowing them to clean up ‘PDG”s Left Lane, crush all Tier 2 Towers, steal 4 more kills and winning the game for a second time. It seemed as if ‘PARADIGM’ didn’t want to let ‘Enemy’ just take the win, so every single member went into “Sayajin Mode” and brought out their best. Everybody on the team was suddenly awake and present, allowing ‘Funballer’ to get First Blood on ‘Vetium’. Despite ‘NME’ taking their first kill at 5:22 minutes and the crazy back-and-forth with – what felt like – 1 death per minute and the camera following the players swinging back and forth on the map at high velocity, our boys stayed strong, taking a Gold Fury 20 minutes in, the score being 8:8. 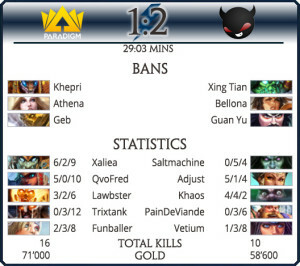 At 25 minutes, ‘PDG’ steps on the gas once more, takes a Fire Giant, exterminates 3 players on the side of ‘Enemy’ (12:9), cleans up Mid Lane, Tier 2 on the right, run down Left Lane, destroy 4 more Gods (16:10) and takes their first win of the set. For the first 25 minutes, the match seemed fairly even: The score was 7:5 in favor of ‘Enemy’, two Gold Furies were destroyed (one for each team) and all around it was a decent back-and-forth…until the clock hit 28 minutes and everything escalated. ‘PARADIGM’ had to make a pick on whom to focus, but due to their choice and way of execution, ‘NME’ sees an opening and turns the tables by killing 4 of our boys, taking the Mid Phoenix and a Fire Giant (10:7). 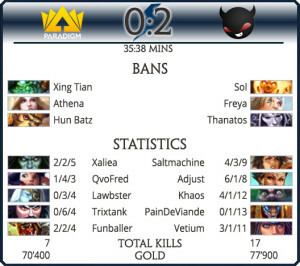 At 31 minutes, ‘PDG”s Left- and Right Towers are stomped, the Right Phoenix falls and ‘Enemy’ makes another Deicide happen, ending the game with their third win and kicking ‘PARADIGM’ out. For the first two games, ‘PARADIGM’ seemed to be in a “restless over-achiever mode”. While they had a good line-up that worked well with one another in the first, the execution of the combos that were required to be performed was very specific. Either Cabrakan or Bacchus had to initiate and get a successful CC off, so the other members could burst the target down. It was a really nice plan and strategy, but complicated to do. During the second match, we saw ‘Trixtank’ often going in on his own, initiating with no follow-up from the team (who was often simply too far away or unprepared). At the same time, ‘Enemy”s Serqet was too efficient at getting to the back-line and taking out the ‘PDG’ damage-dealers, Chronos and Xbalanque, who unfortunately weren’t properly protected. At this point also major props to ‘Vetium’, who provided ‘NME’ with a lot of useful roots and stuns, saving his team’s butts more than just once. Going to game 3, we finally saw the ‘PARADIGM’ we’re more used to: ready to fight, awake and present. That is also when the boys took their first (and only) win of the set, only to then “convert back” to the previous state for game 4. Overall it seemed that ‘PDG’ made too ‘odd’ of picks for the first two games, while letting both, Serqet and Khepri – which set ‘Enemy’ up extremely well – slip through Picks And Bans twice.It felt as if, what we saw here during the set, wasn’t really ‘PARADIGM’. They seemed very off and as if they weren’t mentally there. ‘Trixtank’ going in alone a bunch, towards the end ‘QVOfred’ as well and just generally too much over-extending and “not being mentally there”, which you could tell during the listen-in on coms as well, when a ‘PDG’ member asked “What did they [‘NME’] use?” and the other members didn’t know. I think ‘PARADIGM’ may have simply been under a lot of pressure or burnt out, being the European number 1 seed and having to face off against – what seems to be – this year’s all-destroying underdogs, ‘Enemy’. It was a good set of games either way and I wish good fortune to ‘PainDeViande’ and his team for the rest of the ‘SWC’. Our boys will be back for more soon!